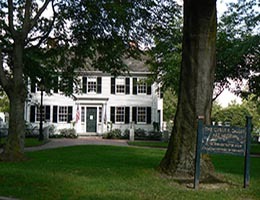 The Arlington Historical Society, with offices in the Smith Museum, offers individual and group tours of the historic Jason Russell House and hosts a yearly lecture series. Through its education and outreach program, the society welcomes school classes and scout groups to explore life in colonial America. 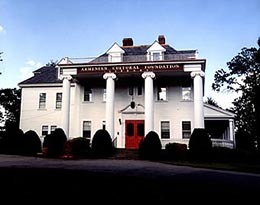 The Armenian Cultural Foundation is a private library and museum dedicated to the preservation and enhancement of Armenian history, culture, and letters. 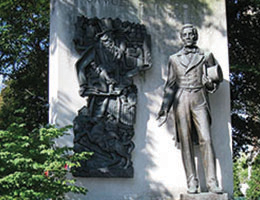 It houses unique Armenian language collections as well as first works of literature, art, history, philosophy, and psychology. Open to the public. 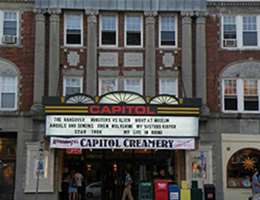 The Capitol Theatre, a Classical Revival-style building, was constructed in 1925 and combined movies and occasional vaudeville shows. 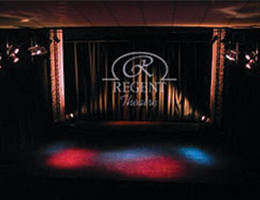 When it was subsequently converted to a 6-screen multiplex, many of its early twentieth-century details were preserved. 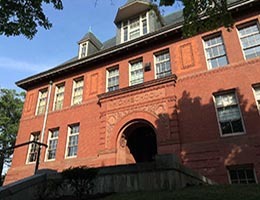 Central School, 1894, was Arlington’s first dedicated high school, now repurposed. Designed by Hartwell and Richardson, the red brick and brownstone building is elaborately detailed with a slate hipped roof, turreted dormers, and an arched entrance highlighted with brownstone relief panels. It’s the new home of the Arlington Center for the Arts. 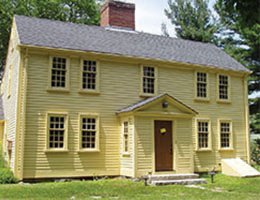 The Jason Russell House was the site of the bloodiest fighting on the first day of the American Revolutionary War, April 19, 1775, as British troops retreated from the Battle of Lexington and Concord. The furnishings in the Jason Russell house date from the 18th and 19th centuries; many belonged to the Russell family who occupied the house until 1896. 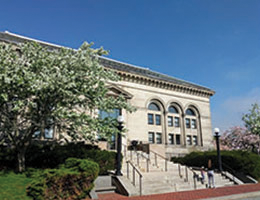 The adjacent Smith Museum houses exhibits and the Arlington Historical Society’s collection of artifacts, manuscripts, and other Arlington memorabilia including the famous Arlington Mastadon Tusk. The Federal-style house, ca. 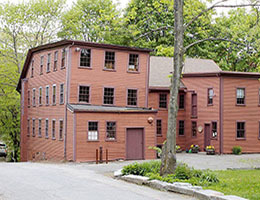 1830, was built for the owner of a local woodworking mill. The building features an ornate entrance with fluted pilasters and sidelights. 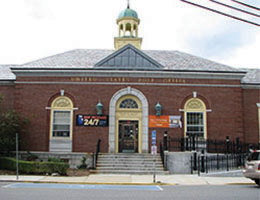 In 1989, it was moved from further west on Massachusetts Avenue to its current location. Today, it is home to the Cyrus E. Dallin Art Museum and the Arlington Chamber of Commerce. In the rear of the building is the Cutter Gallery. In front of the house is Whittemore Park, which includes a small section of exposed railroad tracks, which are the remains of a railway line. To the east and west of the park, the former railroad track is now the Minuteman Bikeway. 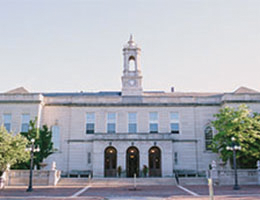 Massachusetts Avenue is Arlington’s primary commercial corridor and the “spine” of the town. It is steeped in history as the site of battle during the first day of the Revolutionary War on April 19, 1775 and has several historical markers. A segment of Massachusetts Avenue, which extends through Concord, Lincoln, Lexington, and Arlington, is designated as the Battle Road Scenic Byway. 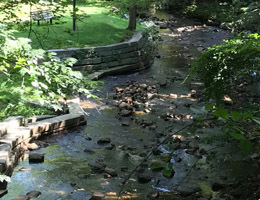 The Mill Brook has deep historical and cultural roots dating back to the 1630s when Captain George Cooke built the first water-powered grist mill in Arlington. The location is now known as Cooke’s Hollow. The brook powered small industrial ventures along its banks. After decades of reconfiguration and development, only limited portions of the waterway are still exposed. The Minuteman Commuter Bikeway (‘Minuteman Bikeway’) passes through the historic area where the American Revolution began in April 1775. 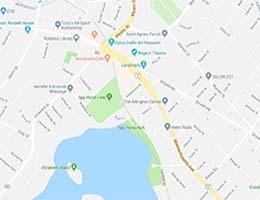 The trail connects Bedford to Alewife Station, running through Lexington and Arlington (where is it known as the Donald R. Marquis Minuteman Bikeway). In 1846, the Lexington & West Cambridge Railroad built and started service on the line. The blizzard of 1977 halted passenger service for good, and the demise of freight service followed in 1981. The current bike path was dedicated in 1992 and completed the following year. 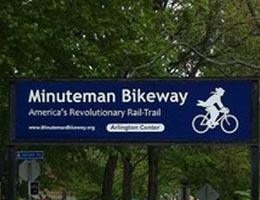 In 2008, the Rails-to-Trails Conservancy inducted the Minuteman Bikeway into the national Rail-Trail Hall of Fame. The Mount Pleasant Cemetery, ca. 1843, is a 62-acre cemetery highlighted by the Cemetery Chapel (1930), a Gothic Revival chapel designed by the architectural firm of Gay & Proctor. 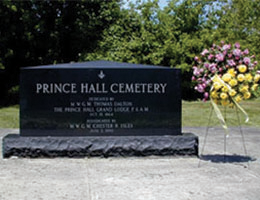 Prince Hall Mystic Cemetery, 1846, marks the only Black Masonic Cemetery in the United States. Today, a monument and small park mark the site where members of the Prince Hall Grand Lodge F & AM, formed in 1776, were buried. 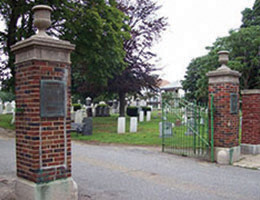 The cemetery is listed in the National Register of Historic Places. Designed in the Classical Revival style by architect R. Clipston Sturgis in 1913, the sandstone Town Hall complements the adjacent Robbins Library. The Auditorium, restored in 2013, is a popular place for community gatherings, celebrations, and special events. 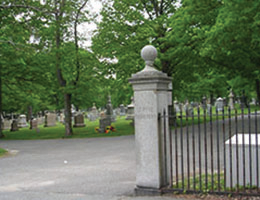 St. Paul Catholic Cemetery was built in the late 19th century and associated with St. Paul Church in North Cambridge. 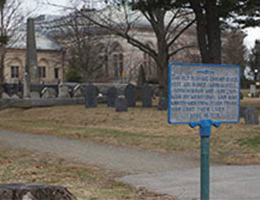 The Old Burying Ground was established in 1732 and is Arlington’s oldest cemetery. It contains an impressive collection of early slate markers dating from ca. 1732. Constructed as a Works Progress Administration (WPA) project in 1936, this red brick building was designed in the Classical Revival style. The building’s lobby features a Federal Art Project mural, “Purchase and Use of the Soil,” by artist William A. Palmer. The Art Deco style mural depicts the Squaw Sachem transferring the land of Menotomy (now Arlington) to the English settlers in 1635. Located at the rear of the Robbins Library is the Federal-style Whittemore-Robbins House, ca. 1795. The three-story, wood-and-brick-framed mansion features front and rear porches and a hipped roof crowned with an ornate cupola. 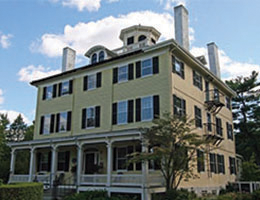 The house was originally occupied by William Whittemore, a prominent local businessman and politician, then owned by the Robbins family. The house was subsequently moved back from Massachusetts Avenue to allow for the construction of the Robbins Library. The building now houses offices, and it serves as a meeting and function facility. The garden was originally laid out in 1913. 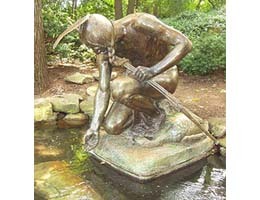 In 1939, Olmsted Associates reconfigured the garden in a more natural design with a rubble rock base for the Cyrus Dallin sculpture, Menotomy Indian Hunter, flowering trees and bushes, winding brick paths, and a circular fountain and a pool. 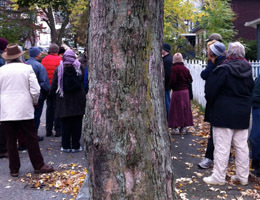 Periodically, Walking In Arlington, a volunteer-run advocacy group, offers walking tours with local historians. Preregistration required.